What are the keys to effective philanthropy? There is so much need in our communities today. As much as you would like to be, the Chicago Bulls and Chicago White Sox just can’t be all things to everyone. We have tried to focus our impact and our giving efforts on specifically defined areas that are important to our franchises for a variety of reasons. Sometimes, you have to say no to others just to maintain your focus on what is important to you. So I definitely would say focus. As with any business unit, you have to hire great people and trust them to do their jobs. I believe the same is true for our giving efforts at the Bulls and White Sox. We have great community relations staffs, with people who care deeply about our fans and who are constantly looking for ways for our programs to have the biggest possible positive impact. Collaboration with community stakeholders who deliver services to those in need is imperative to our success. We can deliver funding and in-kind assets, but we have to partner with the right stakeholders in order to deliver that support. We are not the experts – rather we are best used to support our community partners who do the actual work, make the impact and deserve the credit. 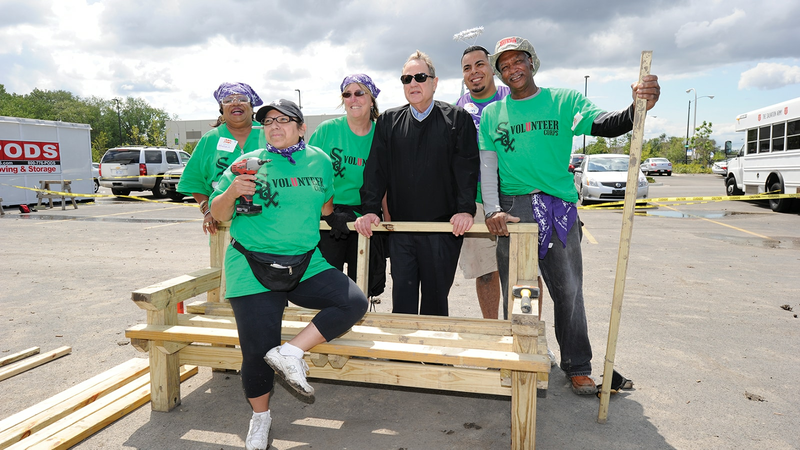 Jerry Reinsdorf joined more than 200 Volunteer Corps members during a 2012 KaBOOM! playground build in Chicago’s West Pullman neighborhood. The White Sox Volunteer Corps has engaged more than 5,000 fans and served nearly 48,000 hours in the community in the last 10 years. You are known as a results-oriented business leader with clear goals and objectives. Do you look at your philanthropic work the same way and how critical are metrics to track the impact of your charitable programs? Metrics have become a very important element of charitable campaigns and are becoming even more so every day. We receive so much support from our fans and our sponsors that we feel a very real responsibility to make sure philanthropic dollars are making a measurable impact. It’s our obligation to be responsible stewards to those who support us. We all want to make sure we are spending our philanthropic dollars wisely, and we always want to have measurements in place to evaluate our efforts. Ninety-six cents of every dollar donated to White Sox and Bulls Charities is put back into the community. It’s an incredible return on a donation and one metric we’re incredibly proud to share. 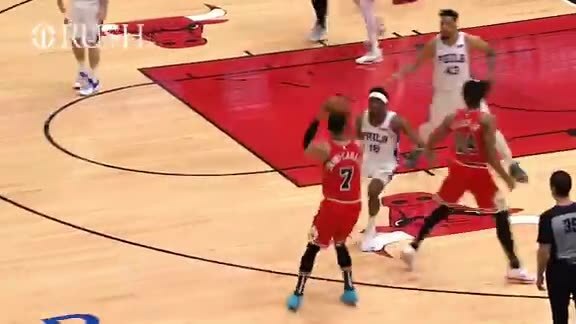 Another example is the Chicago Sports Alliance, comprised of five professional sports teams in Chicago who recently joined together to help fight the gun violence that has been plaguing our city. All five teams – the Bears, Bulls, Blackhawks, Cubs and White Sox – donated funds and in-kind support, but we only agreed to do so under the guidance of evidence-based recommendations from the University of Chicago Crime Lab. Each of the five owners was committed to making sure our money was used efficiently to address the issue of gun violence. The Crime Lab helped lead us to other programs, like the Chicago Police Department’s Strategic Decision Support Centers, READI and Choose2Change, and we have been able to make an incredible impact with metrics to prove it. Do you see it as a responsibility of business leaders and leading companies today to give back and make a difference? As I said earlier, I think it is absolutely true for sports teams and sports owners because of all we get from our fans and our communities. I think the same principle applies across the board to other businesses as well. Altruism, gratitude and karma aside, there is also a simple argument that it is good business, regardless of the industry. Today, it’s an expectation for a business to serve as a responsible steward for its local and global communities. People want to support and connect with brands and products that have shown they care, shown they are committed to improving their communities, the environment, the world. That trend is only growing more apparent across generations. It’s often not just about transactions anymore. It is about building meaningful relationships. Will you discuss the history of giving back for the White Sox and how deeply engrained community engagement is in the culture of the organization? I think that answer is probably easiest communicated through two stories, both about Robin Ventura, who was an All-Star third baseman for us from 1988-97 and then returned to manage the team from 2012-2016. I think the world of Robin. 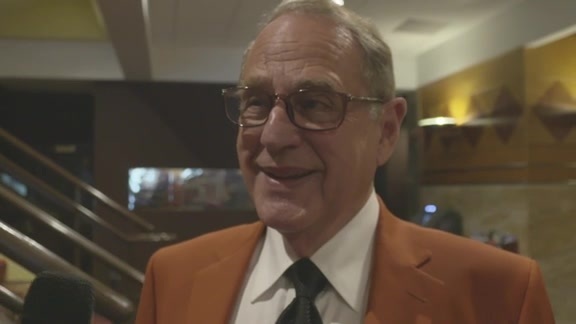 When he was a player, Robin used to go to what is now Lurie Children’s Hospital in downtown Chicago to visit patients, but he always wanted to do it without fanfare. One day, he met a very young boy hospitalized for an intense treatment of a difficult cancer. The child was receiving treatment in a wing funded, in part, by the White Sox. Robin, the boy and his family became close, exchanging photos and cards as this young man battled the disease through his teens. Then, as things happen in life, they lost touch. Robin went on to play in New York, and the young man dropped from his radar as life moved on. When Robin came back to the White Sox as manager in 2012, he got a note of congratulations. It was from the young man, who had beaten his cancer, grown into a 35-year-old and was living a successful life of his own. The two reunited happily at the ballpark one day and have remained friends. Athletes are tremendous when it comes to getting involved in the communities where they play. Robin also befriended a young girl who was battling cancer, and as part of a special Make-A-Wish program, he actually starred with her on stage in an annual presentation of A Christmas Carol. The two stayed close, meeting one another often at the ballpark over the coming years as her treatments continued. Sadly, she lost her battle with cancer, and her death – which Robin learned about at the ballpark one night before the game – was devastating to us all. We remain in touch with her family to this day. Sports teams can write checks, donate tickets and sign baseballs to help raise funds for worthy causes. All of that is wonderful. In the end, however, we are just people, all sharing the same challenges, emotions, victories and losses, together. We try not to ever forget that. What about the philanthropic work of the Bulls? Getting out into the community and giving back to the city that supports us each year is an integral part of the Bulls culture. In 2012, my daughter-in-law, Nancy Reinsdorf, was named President of Chicago Bulls Charities, and working alongside my son, Michael, they made the strategic decision to take the team charity in a new direction with four areas of focus – youth education, youth health and wellness, violence prevention and military and first responder support. Since that strategic shift, the Bulls have contributed time, materials, resources and financial donations to organizations that share our commitment to those four pillars within the community. Nancy has done an incredible job with Chicago Bulls Charities, and both she and Michael are committed to giving back to the community. Last year, the team hosted and participated in more than 150 events that reached more than 200,000 Chicagoans. How do you engage the players in each team’s charity efforts? Athletes are tremendous when it comes to getting involved in the communities where they play. Our players don’t have to be here long to quickly understand that giving back is just part of our organizations’ culture. It is part of who we are. Our manager and head coach preach its importance. It’s expected. They often point out that being on a successful team means, almost by definition, being willing to make your interests secondary to those of others, to give for the greater good. Our community relations departments are active within our clubhouses and locker rooms, talking to players about programs or causes that are important to them and their families. We then try to build programs that work within our vision and also support the interests of the players. Our players, their wives and their families are stretched a lot of directions during a season. There are a lot of demands on their time, but every single player finds the time, finds a way, to help make a difference in Chicago. They are proud of that commitment, and so am I. You have achieved great success in your life, both in business and in philanthropy. Do you take time to reflect and celebrate the wins? Every day. I grew up in Brooklyn sleeping on a cot in an apartment hallway, and I have led a life where I have been so fortunate to have experienced championships, great moments and great friends over my four decades in sports. I am going to paraphrase a famous line from one of my boyhood heroes to answer this question. Jackie Robinson once said that a life is not important except for the impact it has on others. That, in the end, is each of our challenges and each of our legacies. POSTED WITH PERMISSION. COPYRIGHT © 2019 LEADERS MAGAZINE, INC.